A statement that appeared on the Science Daily web site on May 16, based on an article in Science magazine dated May 15, claimed that a stick insect in Southern California had evolved in a parallel manner through natural selection into two separate species. 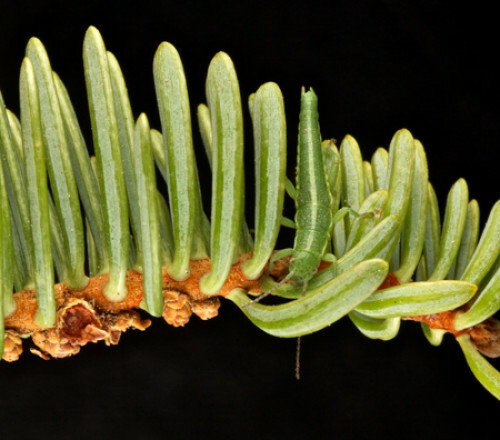 The article described how the stick insect known as Timema cristinae resembles thin twigs and has a camouflaged back. It then went on to say that there are two different variations, one with a white stripe on its back, and one that lacks such a stripe. One stick insect feeds on the needle-like leaves of the Adenostoma bush and is camouflaged thanks to the white stripe on its back; the other type feeds on the broad green leaves of the plant Ceonathus and has no stripe on its back. Due to their Darwinist perspective, the scientists examining these insects with their different pigmentations, both variations of the same species, happily heralded the difference as evolution through natural selection. The fact is however, that VARIATION HAS NOTHING TO DO WITH EVOLUTION. Variation is the name given to combinations of various genes with no new genetic information, proteins or organs being involved. The genetic information possessed by life forms does not change even over millions of years since the moment they were first created. All that happens is variations within species due to different combinations of genes. IN OTHER WORDS, NO NEW SPECIES with brand new genetic information, proteins and organs EMERGE. Asexually reproducing life forms may sometimes be separated from one another through geographic obstacles, such as the collapse of a block of land or, as in the past, continents splitting away from one another, and different genetic characteristics may develop as a result of different combinations of genetic information controlling the same characteristics due to genes being prevented from being transmitted. The different human races developed in this way, through intra-species variations. If there is no genetic incompatibility preventing reproduction between variations of the same species, the members will still not reproduce if they do not regard themselves as close to one another because of behavioral differences. Therefore, since no new genetic information is added to the life forms, evolutionists’ claims about SPECIATION THROUGH EVOLUTION ARE INVALID. In this instance, the only reason for these forms not reproducing with one another is behavioral. There is no obstacle in genetic terms, however. Therfore, no new species has evolved. Indeed, the variations in this stick insect, one with a white stripe and one without, are NOT features that emerged through mutations which only lead to random loss of genetic information or through natural selection that does not change the DNA. The study quoted in the article does not refer to genetic information that didn’t previously exist in the comparison but to a shift in the allele frequency, which results from the alternative states of genes that control specific features. This reveals a variation in the frequency of genes that control pigmentation but that have been present in stick insects right from the beginning. Stick insects with or without a white stripe on their backs emerged as the result of a variation in allele frequencies. However, the genes that control both characteristics have existed right from the beginning, and the researchers say that these characteristics have given rise to variations in metal binding, pigmentation and jaw shape. God created the genetic information for both characteristics since the moment the first stick insect came into being. Fossils records based on 450 million fossils excavated from the layers of the earth and identical to living specimens around today prove that living things were never subjected to evolution, but were created by The Sublime Creator, God.